Posted April 14th, 2019 at 5:38 PM (CST) by Bill Holter & filed under In The News. Jim Grant with stark truth! 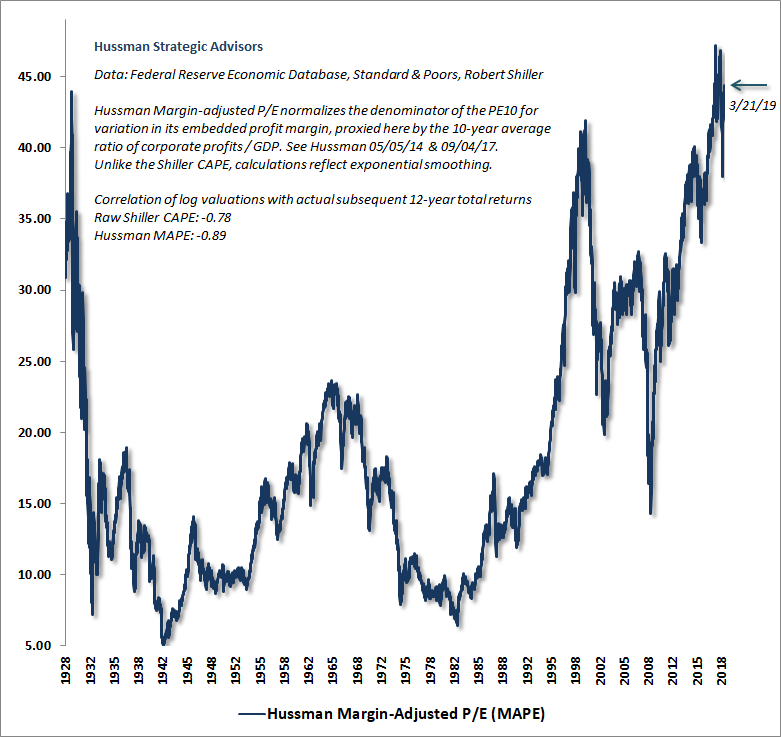 Don’t miss this chart in John Hussman’s article. Posted April 12th, 2019 at 8:43 AM (CST) by Jim Sinclair & filed under In The News. If You Can’t Take A Joke, Don’t Go To Britain! What a way to start a Friday Folks! The Good Morning report starts off with Gold trading higher after a day of forced shorts sending the noble metal sharply lower, only to see enough buying coming in sending Au to a high of $1,299.10 with the trade right now at $1,295.70, up $2.40 with a low at $1,294.30. Silver is leading the charge this morning after yesterday’s morality beating with the trade now at $14.97, up 10.3 cents with the high at $15.035 and a low at $14.90. The US Dollar has lost all of yesterday’s support with the trade now at 96.495, down 31.9 points just above the low of 96.425 with the high at 96.815. All this was done before 5 am pst and the Comex open. The emerging markets Venezuelan Currency now has Gold priced at 12,940.80 Bolivar showing an additional loss of 87.89 from yesterday’s beatings with Silver now at 149.513, a loss of .699 Bolivar. Our eyes are on Britain this weekend with the supposed enforcers of western market law gathering at the “U.S., European Banking Union, and UK Officials Meet for Planned Coordination Exercise on Cross-Border Resolution Planning”. Such a fluffy name for a group that has already allowed the major banks to collude with one another till one got caught and ratted out the rest. We’re hoping some actual law enforcement may be finally applied, but these are political appointees, so we have to wait to see what they “don’t” do for now. Regardless of this gathering, the precious metals are bound to go higher because of all the international printing going on as it seems everyone has turned negative on economic growth. Posted April 11th, 2019 at 9:20 AM (CST) by Bill Holter & filed under In The News. Posted April 9th, 2019 at 12:55 PM (CST) by Jim Sinclair & filed under In The News. Posted April 9th, 2019 at 12:50 PM (CST) by Jim Sinclair & filed under Jim's Mailbox. WASHINGTON— Senior officials representing resolution, regulatory and supervisory authorities, central banks, and finance ministries in the United States, the United Kingdom, and the European Banking Union will hold a meeting on Saturday, April 13, as part of a series of planned exercises to enhance understanding of one another’s resolution regimes for global systemically important banks and strengthen coordination on cross-border resolution. This meeting builds upon two prior exercises in 2014 and 2016. The exercise is planned to coincide with the annual international meetings in Washington sponsored by the World Bank and International Monetary Fund. The Federal Deposit Insurance Corporation will host the exercise. Other senior officials from the United States are expected from the U.S. Department of the Treasury, the Board of Governors of the Federal Reserve System, the Office of the Comptroller of the Currency, the Securities and Exchange Commission, the Commodity Futures Trading Commission, and the Federal Reserve Bank of New York. Expected participants from the European Banking Union include senior officials from the Single Resolution Board, the European Commission, and the European Central Bank. Expected participants from the United Kingdom include senior officials from HM Treasury, the Bank of England, and the Prudential Regulation Authority. Congress created the Federal Deposit Insurance Corporation in 1933 to restore public conﬁdence in the nation’s banking system. The FDIC insures deposits at the nation’s banks and savings associations, 5,406 as of December 31, 2018. It promotes the safety and soundness of these institutions by identifying, monitoring and addressing risks to which they are exposed. The FDIC receives no federal tax dollars—insured ﬁnancial institutions fund its operations. Page queried in 0.779 seconds.